Long before Asian beauty products were easy to get ahold of like they are these days, there was YesStyle. YesStyle.com was one of the first global online retailers to offer fashion, beauty and lifestyle products from Korea, Japan, Taiwan and more at competitive prices. 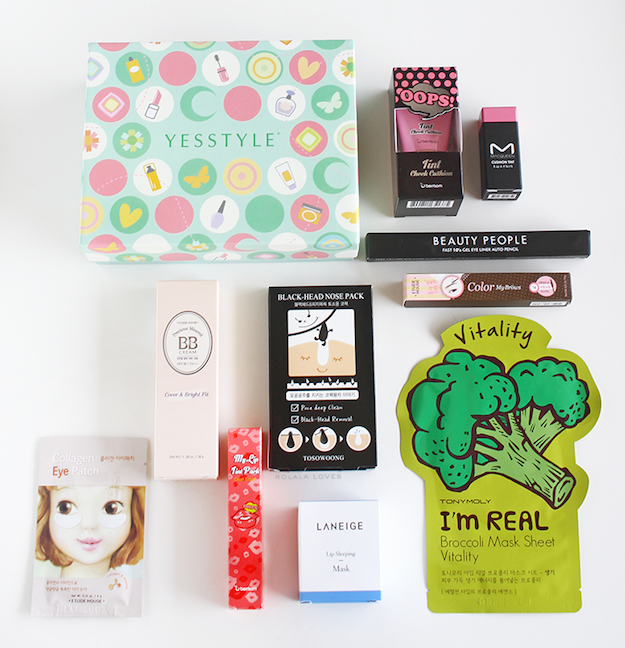 I was recently sent this Korean beauty box that features YesStyle's Top Ten Must Try Korean Beauty Items. These include some of their bestsellers and top customer favorite products. I was excited that all but one of the items are new to me and they're all full sized products. 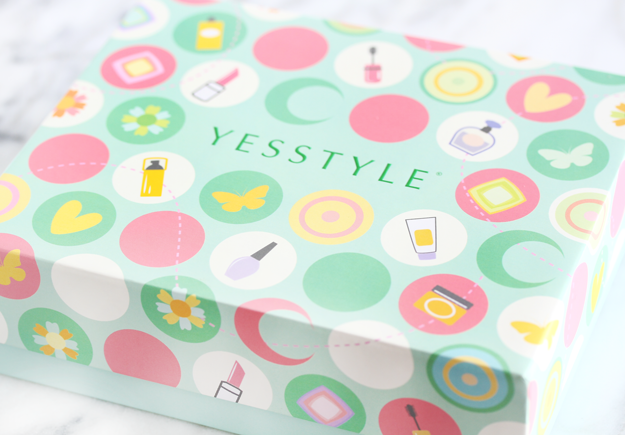 The box itself was sturdy and whimsically decorated with cute beauty product illustrations. MacQueen Cushion Tint Lip and Cheek ($6.21) :A smudge-free lip and cheek tint with a shaped sponge applicator that adds vivid color and moisture. This is a two in one product in a glass jar which makes it eco-friendly but not so travel friendly. The shade I received is 01 Light Pink which is a muted baby pink with a blue undertone. It's a pigmented product that blends down to a dusty pink flush on my cheeks and on the lips it wears like a matte Barbie pink. I liked it better as a blush than a lip color because of the shade and how it felt drying on the lips. Berrisom Oops Tint Cheek Cushion ($9.81) : A lightweight emulsion-type blusher enriched with extracts from 15 herbs and flowers. Comes with a built-in cushion applicator that smoothly glides on for a flawless finish. This is a one piece product with a cushion applicator that makes it easy to apply. It goes on as a creamy tint with a soft buildable finish. Sugar pink is actually a pale peachy shade with a warm finish that looks very natural on my skin tone. This product feels lightweight and imparted a nice glow on my cheeks but it wasn't all that long lasting. Laneige Lip Sleeping Mask ($15.56) : An overnight treatment product made with Moisture Wrap and a Berry Mix Complex which forms a moisturizing protective coating rich in Vitamin C to gently exfoliate and deeply hydrate the lips. Considering this product was one of my recent loves, it is already one of my favorites so I wasn't too upset to see it included in this box. I love this as a overnight lip treatment and wake up with supple and smooth lips whenever I use it. Etude House Precious Mineral BB Cream Cover & Bright Fit SPF30 PA++ ($11.61) A BB cream that smoothly glides onto skin with a Double Fitting Concealer Technology to provide a flawless coverage with a brightening, long lasting finish. This is the first Etude House BB cream I've ever tried. I received the natural beige which is a light yellow based beige that is a decent match for my skin. The product is smooth and buildable with a slightly matte finish. The coverage is about medium. I think it is best suited for combination/oily skin types because of the way it accentuated the dryness of my skin. Beauty People Gel Eye Liner Auto Pencil ($6.90) : A waterproof and smudge-proof eyeliner pencil that delivers highly pigmented color and dries in only 10 seconds. The product twists up and includes a unique pull out sharpener on the other end. Some of the best eyeliner pencils I've used have come from Asia. Diamond Burgundy is deep purplish, burgundy shade with a slight touch of shimmer that is quite flattering with brown eyes. The product glides on smoothly without skipping and it sets as quickly as it claims. This eyeliner is long wearing without smudging. A winner! Etude House Color My Brows ($8.91) : A colored brow tint that lightens or darkens your eyebrows with its natural brown shade, giving it more definition and control. This is a mascara type brow color product. I didn't try it since the Natural Brown color is way too light for my brows. Berrisom Oops My Lip Tint ($8.01) : A unique peel off lip pack that leaves a vibrant color that lasts for over 12 hours without smearing or fading. This lip tint pack is enriched and fortified with premium herbal extracts such as aloe vera leaf extract, marine collagen, royal jelly extract, hyaluronic acid and honey. I received this product in shade 09 Dear Coral which frankly was a little scary because it's a very vivid pinkish coral out of the tube. It has a wet almost vinyl like feel upon application and leaves your lips with a shiny glazed finish. As it dries after 5 - 10 minutes, it takes on the consistency of a fruit roll up. I found it fairly easy to peel off and it left behind a flushed coral stain on my lips that I didn't dislike. To ensure even color, your lips must be properly moisturized prior to using. The lip stain doesn't transfer and it's fairly long lasting unless you happen to eat/drink something hot. When it fades, it almost gives the appearance of ombre lips. 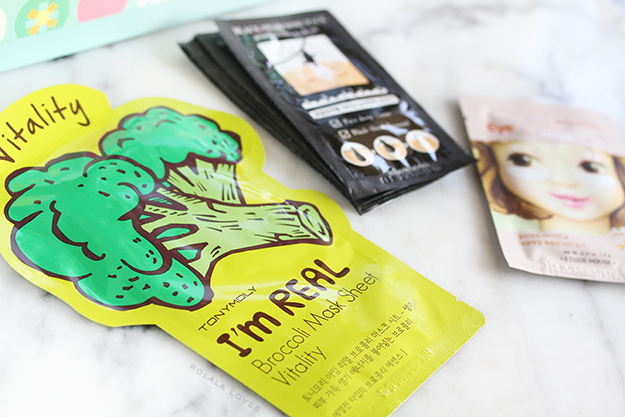 TonyMoly I'm Real Broccoli Mask - Vitality ($3.51) : This sheet mask is formulated with antioxidant-rich broccoli extracts that vitalize tired skin while protecting it from environmental stressors and reversing the drying effects of pollution and UV rays. It provides intense hydration while conditioning your skin to revitalize complexion and boost elasticity level. This is a one piece cotton mask generously soaked with essence. It has a light, clean scent and a cooling and soothing feel. It was refreshing to use and left my skin feeling soft and hydrated. Tosowoong Blackhead & Sebum Out Nose Pack ($3.56) : These pore strips are made with with charcoal, ash, allantoin, licorice extract and Morocco lava clay that work to remove blackhead, sebum and deeply cleanse pores. I have to admit that I haven't used these types of pore strips in many years but I did have my husband test them out and it does work better that the usual pore strip. Etude House Collagen Eye Patch ($2.36) : These natural fiber under eye patches are fortified with collagen to deeply hydrate, brighten and boost elasticity. If you've ever used these types of eye patches before, you'll find that this set is pretty standard. They're unscented and made of a thin cotton material. They adhere well and leave my under eye area feeling refreshed, soothed and brightened. 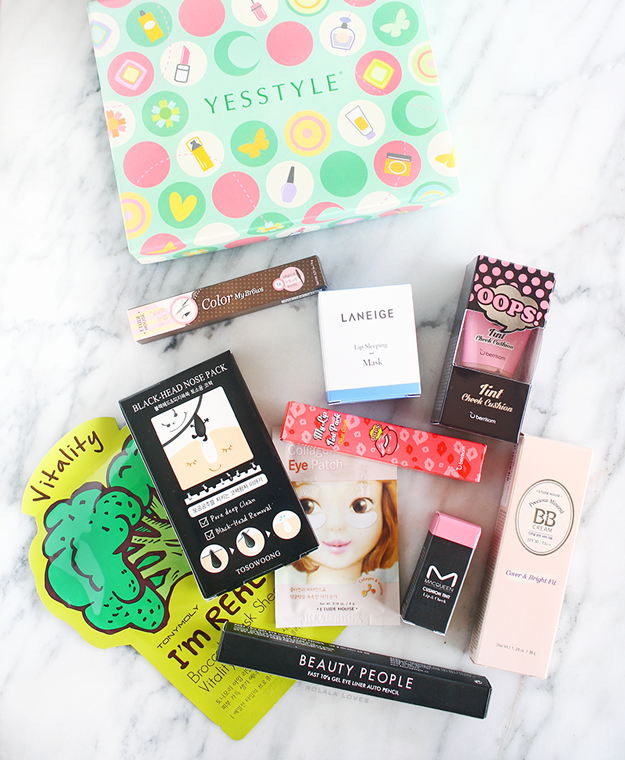 Overall, I think this is a great box in terms of discovering new beauty and it had an interesting mix of items that are a good representation of the innovations in Asian beauty which usually bridge the gap between beauty and entertainment as far as products that are fun to use like the lip tint pack. It was also nice that they were all full size items. Which item would you be most interested in trying? I didn't know that Yes Style was one of the first companies to offer Asian products. This Yes Style box sure seems nice! The packaging is adorable, I really like those illustrations. There are a lot of products here I'm curious about, for example that broccoli sheet mask. That lip and chic tin is barbie pink seems great...too bad that it is too drying on the lips, but at least you can use it on your cheeks. I always like 2 in 1 products, even when packaging isn't travel friendly. I don't travel much anyway. The tint cheek cushion sounds amazing. I imagine that the cushion really makes it easy to apply and it is great that the product feels so light on the skin. That Beauty People Gel Eyeliner Autopencil ( I hope I got the name right) sounds like a fantastic eyeliner, I'm sure it will come in handy. All in all, sseems like a great beauty box! This is different meaning the beauty items I will love to try and also the box its cute. Love the packaging of Korean products. so cute!!! The box's design itself is very pretty and I love the range of products within. The MacQueen cushion lip and cheek tint has really caught my interest, the glass jar is adorable - though pity to hear it's drying on the lips, so many seem to be that way! Have a brilliant week Rowena..
Ooh a lip sleeping mask? That sounds pretty cool as does the Berrisom lip tint. I'll definitely be on the lookout for that! Great stuff and lovely packaging!!! Wow the box is so adorable. I haven't used many Korean beauty products before. These look so adorable, especially that cute lip and cheek tint! I haven't used many Korean products, but a broccoli face mask? I need that just for the laugh. Yes the packaging is quite cute and that sleeping mask sounds like something I would like to try. Great review. And wow I didn't see any drug use on the metro in Paris at all. Couple of crazies but that is about it. It seems that this was a box loaded with useful bits. I would like to learn more about the broccoli mask, and I think I would be interested in that. I like Yes Style, but had no idea that they were the first to offer Asian beauty products like this globally. It's also not too shabby pricing about the international shipping. Have a great new week, Rowena! Korean products are packaged so cute and colorful! This box looks amazing and so versatile. I personally wouldn't mind giving that lip tint a try. Something about peeling away the colour is very enticing bahahahaha! Would love to try the eye patch! Love to try the broccoli mask! Thanks for the visit. Now this is what I call a beauty box! The packaging of all the products is so cute, and indeed it fills the gap between beauty and fun. I would love to try each of these, especially the lip and cheek tint. My sister sends me pore strips often and they work very good for me, so that would be the other item I'd love to try. Have a nice day, Rowena! The packaging is so cute. The sleeping mask sounds like something I would love to try. And I really need to try the broccoli mask. Not so sure about the lip/cheek tint, hate it when it dries on my lips. The packaging on Korean products are just so cute! I love Korean products; they are some of the best skincare I've used. These products all look so lovely too. Have a good week, dear friend!!!! my g+ for you!!! 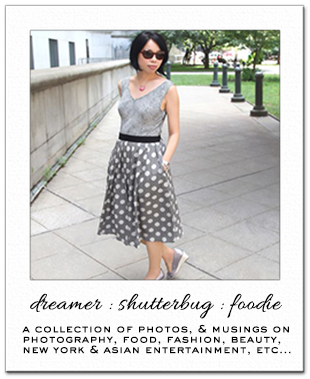 I love that these products are whimsical and cutesy because that's just my style. 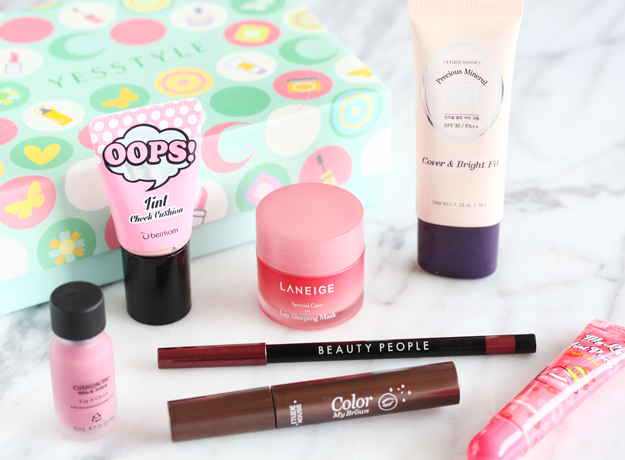 What a fun beauty box! I've seen FB ads and YouTube reviews of those peel-off lip tints, but they're definitely something I'd only try in a beauty box like this. And I'm super curious about that broccoli mask, too! Thanks for sharing!